Mint.com is a personal finance app with budgeting and tracking features best for investors, and personal finance newbies. Its primary feature bases on on budgeting and tracking expenses. Setting up budgets is simple since all your transactions will get auto-categorized into predefined categories after downloading and syncing. Also, you can easily track and manage your goals which will be certainly reflected in your monthly budgeting. An additional credit score tracking option was recently introduced a new feature and it helps you keep track of your entire financial picture. One major complaint from most of its users is in regards to the Bill Pay feature and Mint’s investing tools which are very simplistic with negative reviews users have also reported issues with bank synchronization. Not only will Wallet allow you set a budget and track your expenses by categories but also, you are able to create a budget forecast which allows you to get a full view of the effects of your spending habits. It has some great features that can offer you a completely individualized experience the most outstanding feature being the eye-catching design with an excellent color coding factor. Its goal setting characteristic is another great feature which enables you to plan for future expenses which might need a lot of money. The app includes an automatic bank syncing for your balance and expenses with the option to import your entries and track budgets. Although the app is free, you can upgrade to premium subscriptions at a fee to enjoy a wide range of features. Clarity Money consolidates your financial accounts and transactions into a simple interface where you can see both the fine details of your spending habits and financial health on the other hand. It keeps tabs online item transactions across all your financial accounts besides giving you visibility into the total balances of your accounts and total financial position. The signature feature in this app considers recurring charges which prompt you to check them and cancel whatever services you aren’t interested in. One major setback with Clarity Money is that it lacks tools for budgeting, splitting transactions and cash management besides to providing insufficient information and no independent security verification. Spendee is a free money tracker app for budget planning and money management suitable for people who would rather track their daily expenses instead of a complicated bookkeeping process. The interface of this app is simple and consistent with different color codes, common and understandable labels with an enhanced functionality and interactions giving you a great experience. Its core feature is the daily expense feature which gives you detailed and distinct categories that allows you to calculate expenses that fall under the same categories. The multi-currencies feature also makes it convenient for users to update their default exchange rates. The major cons of this app are the excessive use of animations and layers in one screen besides to the troublesome keying in of data. Home Budget with sync paid budget app is efficient for someone who uses many devices. It allows you to create a budget to manage income amounts and categorize expenses over time. You can add different types of accounts, recurring expenses and in addition to transferring money from one account to another. You can also navigate through the app and input info easily once you set up. There’s an option of setting reminders of the due date of your bills and displaying and forecasting expenses for the next few months. The main setback that comes with this app is the risk of messing up your budget report when you want to make changes since the whole process of overriding and syncing the budget is very complicated. 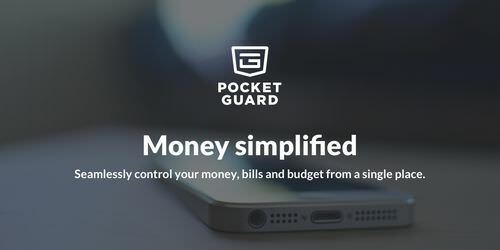 The free PocketGuard app is on its way to being among the most useful personal finance apps. It focuses on projections rather than history and shows the amount of money to spend per day, week and month. The setup process of PocketGuard is quicker given the fact that it is not as detailed as many other apps. All you need to do is connect to your various financial accounts through an encrypted, connection which doesn’t ask you to spend time adding your financial goals. PocketGuard, is yet not a good choice for people with complex financial situations because of its simplicity and lack of a targeted monthly saving goal. IOU is a paid debt manager app with an option of monthly subscription service which allows for very insignificant but essential features including the email reminders and web-based combination. With this app, you can keep track of loans, periodic payments, bills and personal debts all in a single app. Integration with your address book for email alerts is the first set up a step. Its cloud syncing tool is one outstanding feature of this app as it allows you to keep and edit your data on different devices and also allows you to share debts with your contacts. The overall flow of the app includes entry of debt to paying off the debt either partially or fully or even an over-payment. The flow from actual entry to payment is, however, a little confusing. Qapital is a free mobile banking app great for new savers, hands off and goal oriented investors since it allows you to save money by rounding up your daily purchases and other activities. With this app, you can set goals and rules that will trigger transfers from your connected bank account into your Qapital account. It is an excellent savings app since you can effectively set a specific amount of money to save and automate the “set it and forget it “feature so that you can easily save money without noticing. Qapital has properly been configured to enable you to save money towards any future emergencies and other long-term goals.